M says I am a Movie Star Drama Queen. She says some movie stars are temperamental but talented, have healthy egos but are worth putting up with and keeping around. I don't know what temperamental is, but it must be something good because I know I'm talented and worth keeping around! 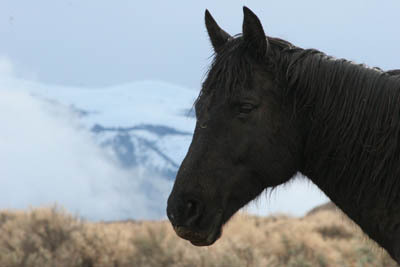 I haven't been in any movies yet but my Grandpa has (Cass Ole was the Black Stallion!) but I look a lot like my famous Grandpa so that means I'm handsome as a movie star. Look at me - am I not? Not sure about the drama queen thing, other than I am dramatically handsome, and M probably means drama king, because I am king of the herd (well, except for Rhett, who I am a little afraid of, but don't tell anybody). I know for sure I'm better looking than that Stormy horse M mistakenly says is the Most Beautiful Horse On The Planet. Huh! He's just a bay Thoroughbred with a sway back and pot belly. I am big and black (well, I will be when my brown winter coat is completely gone) and handsome and trim and not just Thoroughbred but Appaloosa and Quarter Horse and famous Arabian. Top that! The blond girls around here all moon over me and feed me because I am so handsome. Steph doesn't kiss me but she's blond and she feeds me. There's a blond man here too sometimes but he doesn't kiss me, but at least he feeds me. I got really mad when M left me (well, she left all of us) this winter for a month. There was nobody here to kiss me and admire me and give me special treats every day and I was really mad at her when she got back. I wouldn't let her kiss me or even pet me for a day. But the next day I had to have kisses and treats so I wasn't mad at her anymore. And then this Connie shows up, and she falls in love with me (I mean, who wouldn't!) and gives me treaties and she now has me and we did our first endurance ride last month. I was so good I finished 9th, and everybody told Connie how handsome I am. I give Connie good kisses, and Connie always gives me special happy meals and not only carrots, but carrots dipped in molasses! Then Connie left me, but Steph stayed here to feed me, and then M came a few days later and gave me kisses and carrots and told me I was handsome, so I didn't get mad at anybody. M says Connie is coming back soon. Every morning M gives us all a little treatie to eat while she takes Rhett out for a big meal. I always thought it should be ME getting the big meal, and FINALLY, today M took me out to feed me especially alone this morning, instead of Rhett. About time the best looking horse gets fed the most! However, imagine how appalled I was, APPALLED, I tell you, when M walked out with a saddle for me! I skittered around the hitching rail and tried to hide from her there (but there's no hiding such a big hunk like me). I swear, with Connie gone I thought I was here just to look good and be worshipped and fed. Huh. 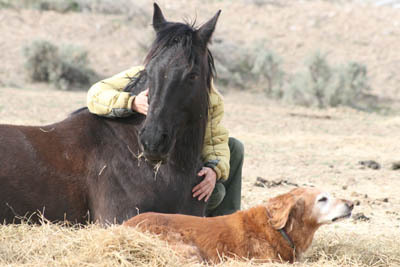 When M got on me I was so mad we were going for a ride, I shook my head and took off for the creek and thought about bucking her off into it, then I dragged my feet because I didn't want to go, then I tried the ol' Put-my-head-down-for-a-bite-of-grass-then-turn-back-toward-home-when-I-lift-my-head-up trick, and I swished my tail this way and that, and I tried to walk sideways off the trail, but before I knew it, I was up and over the Little Tevis trail down into the wash on the other side, and I was cruising up the wash looking good and having a great time. Go figure. It was a fun ride. 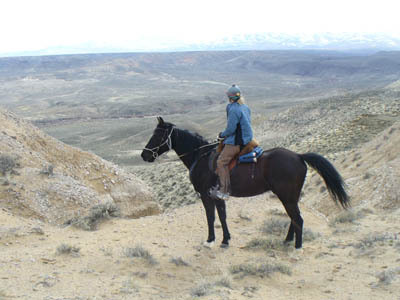 I got a good workout to keep my manly muscles in shape, and I got a carrot in the middle of the ride, and I got to eat grass and salt bushes on the way back. When we got home M asked me to do some side stepping and I got all flustered and threw my head up and down and had a tantrum because it's so much effort and a big beautiful horse like me already knows how to do all this and should not have to be asked to do it again, and after I had my hissy fit I did it just fine because it really wasn't that big a deal after all, and everything was good. Then I got to have another happy meal! I wanted to kiss M at the end of it but she didn't want to kiss me. 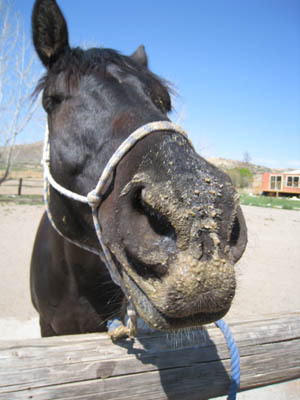 So what if I had food all over my nose and face and forelock? Who wouldn't want to kiss such a handsome movie star anytime anywhere? 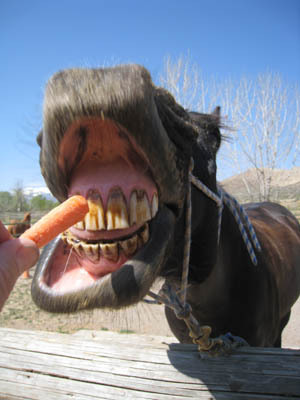 But she did give me a carrot, and told me I was a very handsome drama queen. I'm sure she means very handsome Drama King, which I know I am, with a big healthy ego!